A highly versatile and productive line which is a genuine “ALL-IN-ONE” solution for finishing operations. The line can include different work stations for multiple tasks and process optimisation. 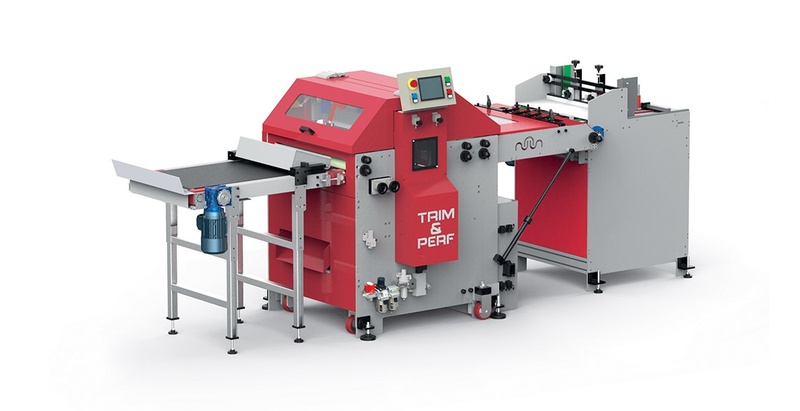 The combination of TRIM&PERF with complementary modules offers high quality products combined with reliability, allowing the needs of digital systems to be met, as well as those for binding and, in particular, the production of specific products for single and multi-up work IN A SINGLE PASS. Our company specialises in “ON DEMAND” products and is always able to offer NON-STANDARD solutions. + CONTINUOUS FEEDER Rubber belt type for folded and saddle stitched products and perfect bound books. + 3 WAY This module allows perfect alignment of digital sheets to a print reference mark. + GRIPPER Electronic system for PASS die-cutting: reduces machine set-up time, reduces preparation times and overlaying, allows a high level of product repeatability and reduces costs of American style dinking dies. + WASTE EJECTION The system allows diecutting without waste, clean shape products. + THERMO STICK Sticks together some sheets on the ink reference sides by thermo welding – improving the die cutting production process. + PRE-CUT DEVICE Perfect ‘spine’ cutting system up to 14 mm thickness. + TEAR OFF – PULL AWAY The system pull away mingled perforation sheets in preparation for the sewing step. + SIMPLE DECK Collect cards in series after die cutting. + EXIT BELT Shingle delivery belt with batch counter.